Sapphire is the September birthstone. While Sapphires come in every color of the rainbow, Blue Sapphires are the most highly prized in the world. This ring contains 0.25 carats of perfectly matched deep blue Sapphires and 0.07 carats of Diamond accents set in a 14k white gold milgrain edged band. 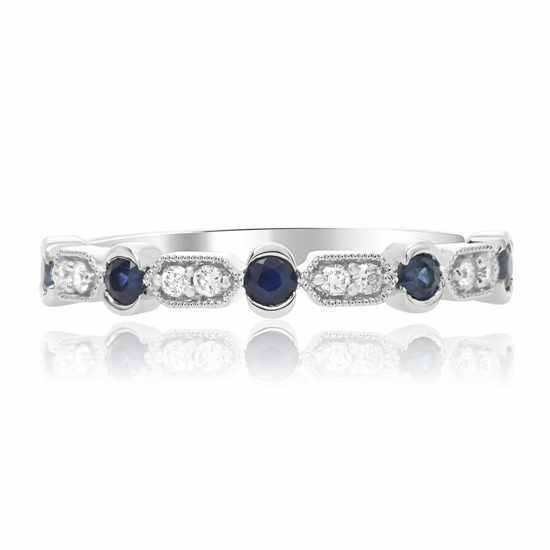 Until only recently, Sapphires were worn exclusively by royalty and were the most highly prized of all gemstones. When you wear Sapphires, know that the Universe has your back – that’s why kings and queens wore them. Sapphires help you accomplish your goals, remove obstacles and clutter from your life and check items off your bucket list.